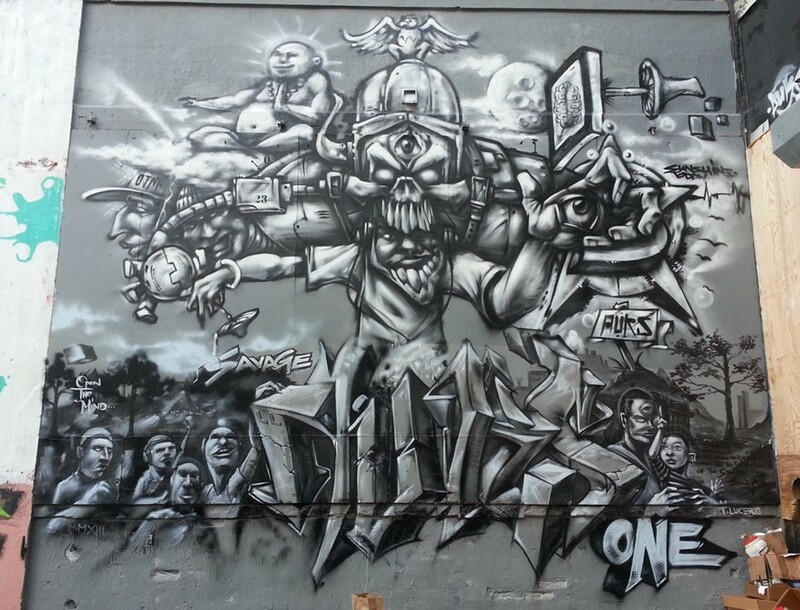 In response to the most recent NY Times article titled “Graffiti gets paid at 5Pointz. Now What?” (February 20, 2018), I felt the need to reflect on its impact and interpretation. One, perhaps most valued amongst the 21 artists involved, is the acknowledgment from the institutionalized art world. I think it is essential for the art world to have a greater input in the discussion of 5Pointz and the Landmark VARA verdict. The verdict, as many other publications have noted, is an acknowledgement for all the artists involved that their work was recognized by the courts. But more importantly, their art and their art form, has been recognized. This impact of the influence of the street art language needs to be reassessed, as artists as early as the 1970s which have been cast as “conceptualist” actually were more dependent on a nonacademic history. Why has art history in particular been so slow to this agenda – lagging behind other areas of scholarship and cultural evaluations in America and aesthetic history? The current show at the Bronx Museum on Gordon Matta-Clark, entitled “Anarchitect” underscores the centrality of graffiti art to more institutionalized historic art forms. Hopefully, it gives serious pause and reconsideration to the great limitations of art history to date in understanding and properly positioning graffiti art's role in the trajectory of institutional art. Yes there are shows on graffiti art (which have been amazing) – but how does most of art history and more importantly, the historians, locate its influence? The question I pose to myself, and the art world, with its revisionist impulses, is why it has taken so long for art history to re-position its place in not only in history but in contemporary culture? In a world where community and activist art, revisionist history, and the politics of cultural influence are well trodden and accepted- why is there no frank discussion of graffiti art as one of the victims as well? The art world needs to acknowledge that vernacular culture was and is central to the visual language of the 70’s onward and the postmodern age and its notions of “pastiche” are just one of the many styles which aggregated visual impulses and languages. Furthermore, street art is highly published and acknowledged in other areas of scholarship that assigns cultural significance including architectural history, urban studies, American history, and visual culture. Two images attest to how graffiti art informed Matta-Clark’s practice, his artistic activism, and conceptual focus on public art. His works inherently recognize their debt to graffiti art as a form, but also acknowledged its aesthetic strategies as revolutionary. He clearly states, as quoted in one of the catalogue essays, his desire to take his art form “directly to the streets,” echoing the agenda of generations of street artists. Not only was Graffiti Truck (1973) a literal testament to his immersion, and perhaps debt, to graffiti culture, but also projects such as his proposed Resource Center & Environmental Youth Program (Loisaida 1977). Matta-Clark's entire series, which he called "photoglyphs", quite literally, appropriated through the act of photographing, the imagery of graffiti art and thereby placed the voice of the graffiti community, both collectively and individually, in the center of his art work. We need to expand the view of art from the teleological perspective to an inclusive viewpoint of the broad slew of cultural influences which now constitute “art”. We are no longer in the period of modernism – wherein one art form begets another in a linear fashion - even if much of the current art history continues without revision. Although the near past has often subjugated vernacular art forms to be perceived as “lesser than” more institutional art forms, or at best, perhaps running parallel to the development of those art forms, it is one which requires serious revision. Such an outmoded hierarchy of art forms exposes a bias among a small minority of institutional thinkers - and is tantamount as one denying rap music’s transformational role in music over the last 30 years. It is simply not credible to anyone who is aware of cultural currency. As art evolves so must academic art history and the makers of that history benefit by presenting a valid cultural viewpoint which is both inclusive and relevant. “Stay High” (whose legal name Gordon Wayne Roberts) was a historic graffiti artist who regularly visited 5Pointz, was part of the community and a friend of Meres One. He tragically died in 2012, destitute and largely unknown to the institutional art world but a legend in the urban art world. He was especially known for his bubble letters, which are now of renewed vogue, but also his later adopted tag, when the graffiti art world became the street art or urban art – he promoted the language as an art form. He adopted later in his life the tags of "Ex. Vandal" as well as “Voice of the Ghetto" to acknowledge the changed status as well as the historical origins of the art form.